Box Text: The Greatest Soldier Fights In The Name Of Peace! Stories tell of a legendary soldier named Naked Snake. 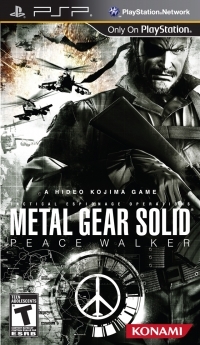 In the shadow of nuclear war, his soldiers move into action in the first official Hideo Kojima game on the PSP system. 10-24-2011 snakes Box Text The Greatest Soldier Fights In The Name Of Peace! Stories tell of a legendary soldier named Naked Snake. 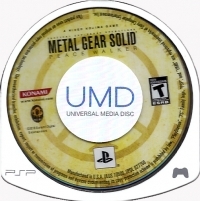 In the shadow of nuclear war, his soldiers move into action in the first official Hideo Kojima game on the PSP system. 09-06-2011 scott Box Text The Greatest Soldier Fights In The Name Of Peace. Stories tell of a legendary soldier named Naked Snake. 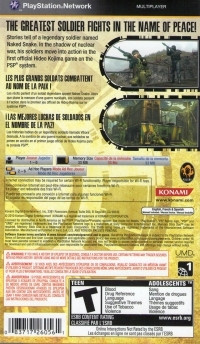 In the shadow of nuclear war, his soldiers move into action in the first official Hideo Kojima game on the PSP system. This is a list of VGCollect users who have Metal Gear Solid: Peace Walker in their Collection. This is a list of VGCollect users who have Metal Gear Solid: Peace Walker in their Sell List. This is a list of VGCollect users who have Metal Gear Solid: Peace Walker in their Wish List.